You still find apricots in the market in July. I found this recipe in a book by Marianne Paquin: “In Tavola Appena Colti!” The combination of apricots and rosemary really interested me and I wanted to experience it. My family loved it. We could define it as a nice treat to substitute dessert. Wash the rosemary, dry it, and divide it into 24 small sprigs. Wash and dry the apricots, cut them in half and take out the pit. 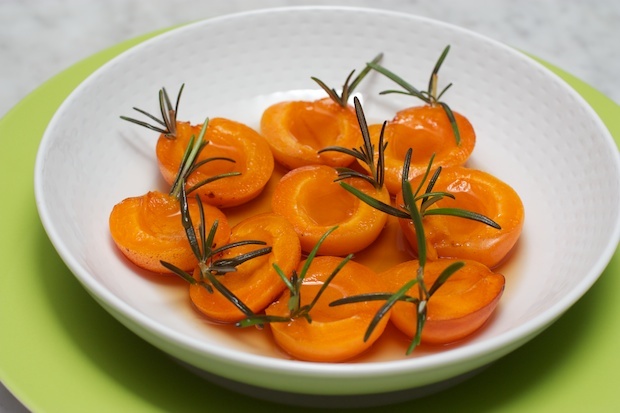 Insert a half a small sprig of rosemary in each apricot, as in the photo. In a large saucepan pour the wine and the vanilla and cover halfway. When it boils add in the apricots with the cut side up without overlapping them. Continue cooking for 15 minutes. Let cool and serve on dessert plates with the cooking liquid.